Thanks to Hilary Custance Green (who edited part of her family history and that of many others) and to Katie Eaton from Pen & Sword Books Limited (www.pen-and-sword.co.uk) for sending me a paperback copy of this book that I freely choose to review. As a reader, when it comes to stories about the war, I’ve always been more interested in the individuals (both in the front and back home) than in the way the battles were fought. I had heard, read, and mostly watched TV programmes and movies about Japanese war camps (I won’t forget Tenko in a hurry). Probably lots of people have. This book provides the personal experience of a family whose lives were affected and transformed by the war. We get to know Barton (Barry) Custance Baker, born in Malaya, before the war; we later learn of his marriage to Phyllis and then we follow him all the way back to Malaya and read on as he becomes father and prisoner of war. We also read (thanks to the correspondence of the period, some that reached its destination and some that didn’t) about Phyllis’s life, the thoughts of those left back home and the way they tried to hang on to hope. The book combines letters from Barry to Phyllis about his life in the East, most of the time not sure if any of them would make it to his wife, letters from Phyllis to Barry, trying to keep up his spirits with news about their son, Robin, and his family, and the diary Barry wrote, containing more details about his time abroad, although always trying to emphasise the positive and understate the difficulties. The combination of these narratives creates a complex and complementary testimony of the varied experiences of the war for those on both sides of the conflict, such as the difficulty of being away and separated from those you love for years, missing the early years of a son you hardly know and worrying that you might no longer know your partner when you go back (or when they come back), and contrasting the often mistaken ideas and thoughts about what the other party might be enduring. 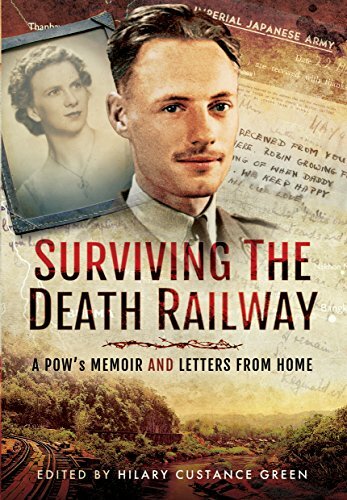 Barry’s parents thought he would be bored as a PoW, never imagining he would be building a railway line, the Thailand-Burma railway, appropriately called Death Railway, as it cost so many lives (not only British). That he, as an officer, might be engaged in heavy labouring work, starved and ill did not enter their imagination. Barry also had little concept of life back home and did not have news of his parents’ move to San Francisco to help with radio transmissions in Malayan or later, of the death of his younger brother, John. He imagines there might be some restrictions and even danger, but not how unsettling the lack of news was. Barry’s efforts trying to ensure he kept track of his men and that he did all he could to keep them safe were echoed by those made by Phyllis, who tried her hardest to create a network of information to share any news between the relatives and friends of the men in her husband’s unit, sending encouraging letters, and even creating a dossier with as much data as possible about all the men, to facilitate the task of the War Office in identifying and reporting their fate. The book is extraordinary too because it clearly shows the tireless efforts they all made to try and keep in touch at a time when communication with each other wasn’t only a click away, and when sometimes years might pass without any news of the other person (and in the best case scenario the news might be years old by the time they get it). Forget about 140 characters on Twitter. The rules of their communication kept changing and at some point they could only send 25 words to their loved one, and that included the date. And the best they could hope for was a prewritten card with only a few words added by hand. If physically the experiences are very different (although not full of gross details, we get a clear sense of the trials and suffering the men had to endure), mentally, the toll of the lack of information, of the separation and the impotence is clear on both sides. And those letters of mothers, girlfriends, uncles, asking for information about their loved ones, sharing the good and bad news, but always trying to encourage the other person, no matter what their lot has been, are impossible to forget. Even the replies to Phyllis request for particulars about the men convey so much more than what is written. It is amazing how a few words to describe somebody can be so full of feeling and be so touching, and how much they say about unspoken emotions. As readers, we can but share in the feelings, and are touched by the hopes, anxieties, and stress of the situation. We are given an extraordinary insight into the lives of people whom we might have known, and who could have been our neighbours, friends, or family. We read about their joy at the impending reunion and their wish to get to know each other (and the worry that they might no longer recognise or like the persons they have become). Barry and Phyllis become our ersatz family and we’re happy to learn they had more children and lived happy and fulfilling lives. I was particularly moved by a moment towards the end of Barry’s life when he’s ill in hospital and for a moment believes he’s back at the camp. When his daughter (Hilary) explains to him what has happened since and he realises he’s ill and dying but has lived a full life he says ‘I’ll settle for that’. I hope we all can say that when our time comes. Hilary Custance Green, the editor of the book, and Barry and Phyllis’s daughter has found the way of letting the letters and the diary tell the story, with very little explanation or unnecessary interference, other than minimal clarifications or explanations when needed. The material is powerful enough in its own right. She has done a great job and the book is a great memorial not only to her parents but also to all the men and women who went through the experience. At the end of the book, there is a call to anybody who might have information about families of members of the Men of 27 Line Section to get in touch with the editor. Don’t forget to pass the message on if you know anybody connected to the men or with contacts who might have more information. In summary, this is a fantastic book for those interested in World War II, both from the point of view of war action and of the home front, those interested in stories about PoW, tales of human bravery, valour, endurance and the heroism of extraordinary ‘ordinary’ people. Don’t miss this book and don’t forget to pass it on to anybody who might have known a member of the unit.